We only get a few days a year to target halibut on Washington’s North Coast, and with this weekend’s favorable forecast anglers couldn’t be more excited. Since quotas only allow us a few days a year to fish everybody is chomping to go. In fact, last week it was a gnarly out there. Conditions weren’t good and most boats weren’t able to get out. Fortunately, this round of open days looks good for anglers fishing Neah Bay and La Push, which are open Thursday and Saturday. I think there will be an extension because no one got out last weekend, but we’ll have to wait for word on that. It’s no secret that the best halibut and lingcod fishing off the Washington Coast is in the deep water along the coastal shelf where there is an abundance of upwelling that brings a rich variety of food supply including, squid, shrimp, sardines, herring, octopus and other food sources. Meanwhile, reaching depths of 500-700 feet is often necessary to catch these fish. Keep in mind; these depths are surrounded by darkness. There’s lots of stuff moving around on the ocean floor. Therefore, having smelly bait, that’s tough and holds up is imperative. Over the years I’ve found large herring and sardines are preferred choices of bottom dwellers. However, the problem is (especially with the sardines) is they can fall off, or be chewed off, easily if they aren’t prepared and rigged correctly. When dropping bait down 500 feet or more you want to know there’s bait on it. Consequently, without good bait you won’t get bit. Or recipe to success is straightforward and simple. Creating good halibut and lingcod bait is much easier than curing eggs. We brine our herring and sardines in Natural Fire Brine, add scent and more sea salt to make the bait as tough as we can. Personally, I use Fire Power and Halibut & Rockfish Nectar. Bottom feeders are big krill eaters and the stronger the scent you put down the better results you can expect. The important part is to make sure you mix this brine and let it sit for a day before you fish. This way the bait has ample time to absorb the brine and scent. At the end I pour in a half bottle of Chartreuse or Orange Fire Dye. The dye doesn’t do anything for my bait, but does have very strong UV qualities and at 500 feet down those help the bait stand out. Rigging for halibut is standard. It’s important to have enough weight to reach the bottom. Usually, two or three pounds is enough. I’ll run it on a short slider, about 18 inches long. This will help get the bait down the hatch of whatever bites it. I use two 10/O hooks with a big spread between them so I can thread the bottom hook down around the spine. This helps keep your bait on. Once we catch limits of halibut we switch to a basic pipe jig that is wrapped with our brined and scented herring or sardine. I rig the pipe jigs with small wire that can be wrapped around a filleted piece of the bait. This will add attractant to the jigs and make it twice as effective. 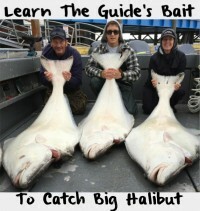 There are lots of methods to catch halibut and ling cod but this is a no nonsense no brainer presentation they cannot resist. It’s been a consistent producer for us and will be for you, too. Editor’s Note: Sean Orr operates Washington West Fishing Adventures. For more information on his guided salmon, halibut and lingcod trips please visit http://www.washingtonwestfishing.com. Anglers are urged to check with the Washington Department of Fish & Wildlife for updated openers and closures at http://wdfw.wa.gov.